There were a dozen teenagers in central Brooklyn wielding knives and fire in Tompkins NYCHA houses before officers of the NYPD were ushered in. But this time, the police were not there for law enforcement. Rather, they were invited by the youth themselves to judge and celebrate their Teen Battle Chef “Final Battle.” In recent months, such scenes played out across NYCHA communities in 3 boroughs. This is a strategic partnership among FamilyCook Productions, the Mayor’s Office of Criminal Justice and NYC’s Department of Youth and Community Development Cornerstone Program. The partnership is an effort by the Mayor’s Action Plan (MAP) for Community Safety and Building Healthy Communities. Cornerstone programs deliver youth development programs and operate through a DYCD contractor such as Grand Street or University Settlement. FamilyCook trains their staff to run Teen Battle Chef. The goal: develop youth leaders who will share their cooking skills in a meaningful way for their NYCHA community to enhance health, well-being, and yes, safety too. The response from each NYCHA community has been very enthusiastic. 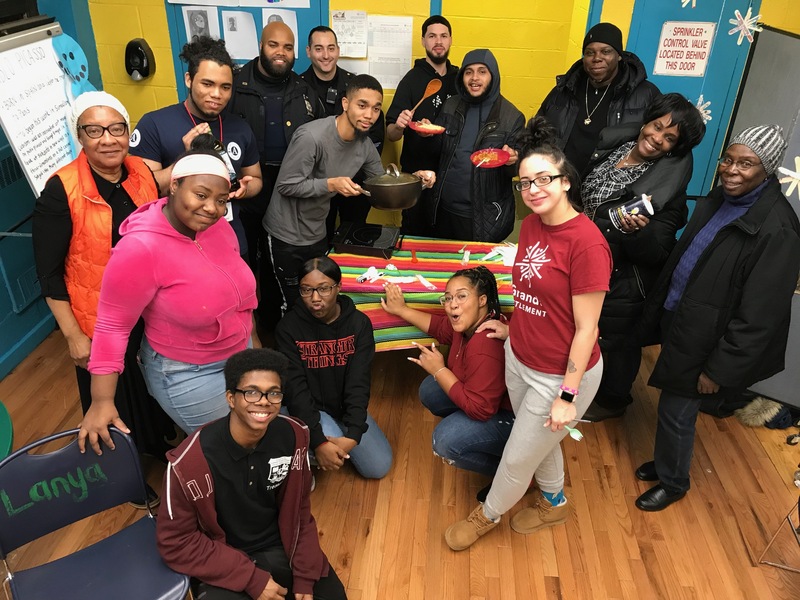 “The youth have really embraced the program and it was remarkable and unusual to have the police in the same proximity as our youth with no tensions,” notes Stally Ojeda, the Tompkins Cornerstone Director. The newest Cornerstone to take on Teen Battle Chef is the Gerard Carter Center in Staten Island. Staff Director Ranti Ogurnleye had big plans for and sees multiple benefits of food skilled youth at the Carter Center. Intergenerational programming and food pantry cooking demos are just a few of the ideas Ranti has up his sleeve. Meanwhile, more NYCHA Cornerstone Programs will join the Teen Battle Chef movement later in 2019. It’s exciting to see progressive city agencies recognize the power of food to support community healing in the aftermath of violence. With violence comes heightened tensions, but as delectable aromas waft through the atmosphere, the shared appreciation for delicious food promises a path for common ground.